I never in my wildest dreams imagined that specific red wines pair better with specific cuts of steak. Guess what? They do. 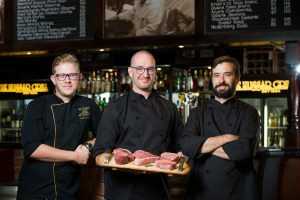 A media visit to the legendary Hussar Grill in Mouille point took us through a fascinating – and delicious – pairing of choice cuts of matured steaks HG serves, along with some seriously top flight reds. mind blown My personal favourite was the fillet and Pinot Noir, even though I’m not a fan of fillet per se. Rump and Merlot was a surprising success, too, though neither are favourites of mine: simply a dream combination. All in all, a truly eye-opening and mouth-watering experiment I can highly recommend you try yourself! It is common knowledge that red wine is a wonderful accompaniment to red meat. But certain cuts of steak pair better with certain cultivars. This is because various types of wine differ widely in taste as do different cuts of meat. While all grapes come from the common grape vine, Vitis vinifera, every grape variety (or cultivar) bears distinct leaves and grapes. So, the wine they make will release different aromas and flavours specific to that cultivar. The same can be said for different types of steak. Each cut comes from a different part of the animal and offers different flavour profiles. What’s more, cuts from different breeds of cows offer different taste profiles. Red wine is considered a better match for red meat than white wine because red wine has a high tannin content whose astringency helps cut through fat. A general rule is to match the intensity of the dish with the wine. 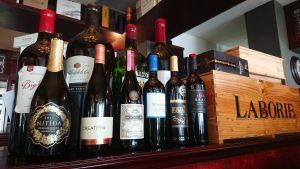 However, The Hussar Grill is firmly of the view that you should enjoy meat and wine to your personal preference. The softest, most delicate cut of meat is Fillet as it comes from a part of the cow where muscles are hardly used. Fillet is best served rare or medium rare as it is lean and will dry out if cooked too long. Rump steak is from the hind quarters, where the muscles are not too developed. It can be served medium-rare. Sirloin is a fattier cut that should be cooked to the medium stage. 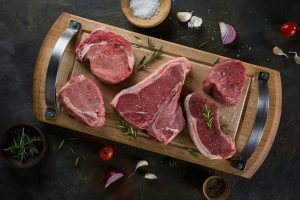 Rib Eye, which is marbled with fat, needs to be cooked medium or more, to help break down the fat content and caramelise the fat into flavour. The leaner the red meat you are matching, the lighter the red wine you can use. A light-bodied wine should have slightly higher acidity that will cut through the texture of the lean meat. Also, the leaner the meat, the less it needs to be aged and therefore the less cooking time needed. Same goes for the lighter-styled wines, as they need to be aged less, too. We’ve paired Fillet with one of the lightest red wines, Pinot Noir. The magic of this pairing is that the acidity of the light red wine cuts through the delicate texture of the rare steak without overpowering it. We’ve paired Rump with Merlot because Merlot is the ideal “in-betweener”, an easy-drinking, smooth option. This medium-bodied red wine matches the Rump as it is equally flavourful and soft. We’ve paired Sirloin with Shiraz. This bold red wine complements the steak thanks to its high tannin count, which acts as a palate-cleansing astringent with this fattier cut of beef. The king of red wines, Cabernet Sauvignon is often the number one choice for steak and wine pairings. It is a full-bodied wine with robust fruit tastes and powerful flavours that can stand up to the richness of a Rib Eye. The tannins derived from the red skin of the grape combine with a high alcohol level, and this helps cut through the marbled fattiness of the Rib Eye, making the wine taste smoother and less bitter and the steak more flavourful. The more marbling the meat has, the longer the cooking time. If served medium, the cooking process melts the fat and the caramelisation process turns what would otherwise be a tough steak into a juicy, tasty one. Bone adds additional flavour to meat due to its marrow content. This means that a Fillet on the Bone can pair with a more robust blend instead of a light red. Finally, Sirloin on the Bone can pair with a full-bodied Red Blend as the steak is more flavourful than Sirloin off the Bone, for the same reasons above. More in common than you think! 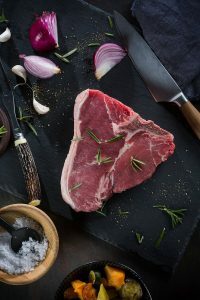 Besides pairing well together, and each having a variety of flavour profiles, red wine and steak share interesting similarities in the way that they are aged and stored. If a wine is made to age (and remember, most wines aren’t! ), the ageing process helps to further develop flavours and textures we would otherwise never have experienced. With ageing, the tannins soften and flavours develop secondary and tertiary aromas. Any wine lover will know that ageing wine can potentially help improve its quality. This distinguishes wine from most other consumable goods – except steak. The Hussar Grill steaks are always aged. Ageing is a process of preparing beef for consumption by breaking down the connective tissue to make it more tender. In general, the older the meat, the darker and richer it becomes… just like a wine. The Hussar Grill wet ages its whole meat for a minimum of 28 days before portioning it for grilling. 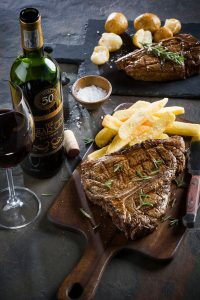 The Hussar Grill carefully sources its A-grade beef from the North West Province and its major supplier is a family-run business. Wine needs to be stored very carefully in order to age well. Some basics include keeping wine in a dark space, with corked wine bottles on their sides, and with the temperature at a cool constant. The optimum temperature is 7-18 degrees Celsius. The most important things to remember are that your wine should never be exposed to oxygen (once it is, you need to drink it) and not too much light. When it comes to steak, storage temperature is also vital. The Hussar Grill steaks are vacuum-sealed to avoid any oxygen and stored in a cool 5-degree Celsius fridge.